Somewhat like a roller-coaster not everybody wants on, but what a ride! The show is drawn well and it has fleshed out characters that while flawed seem to assemble together well. The voice acting is very well done with surprisingly witty writing (this was on the edge of a lot of anime finding use of sarcasm). As I said in the title not everyone loved this show, in fact at the time of release it was one of the most polarizing shows I'd seen that season in fans both loving and hating it. I personally enjoyed it but I can understand that not everyone will enjoy the same content. Also interesting is this show was the jump point for a lot of cliches(not a bad thing) becoming popular in later and more recent anime, see you if you find them as you watch. *thanks for the heads up lime527. Good animation, nice character design, and a light-hearted story make Suzumiya Haruhi no Yuutsu enjoyable to watch. After my first viewing, I thought that this anime was pretty good, but but was much better on for a second watch. This is because it is done out of chronological order, and once you re watch it in correct order you notice connections you didn't see before. (OR it may be that you see a second meaning to some events you didn't notice before) You may want to read the original novels (not manga) by Tanigawa Nagaru before/after seeing this. The anime is very good at visualizing every detail in the stories it shows. However, there are some short stories from the book that are not animated, but are referenced to. (bamboo w/ wishes attached shown in episode 14) Overall, this anime is actually very good once after brief analysis of the plot (reading the book improves upon it as well). It is a nice break from the shounen-jump anime that seem to be taking over. Finally, one of the best anime of all time is on Crunchyroll! This... this was my gateway anime... The first I ever watched that got me hooked... My most favorite anime of all time!!! I gasped and teared up quite a bit once I saw this was added to Crunchyroll. The struggle I went through to find legitimate DVD copies of season 1.... And now it's finally HERE!!! MAy be you don’t understand what I write. What I want to say is I love this Anitama! This anime was the big one for me when I was in high school, and I make it a point to rewatch it at least every other year. The animation is still a joy to behold, the music superb, and the voice acting unforgettable. Each character has an great arc, even the minor side characters. But what shines most of all is of course the story, which (assuming you're watching the proper broadcast order) is still a roller coaster ride of mystery, playfulness, and terrific payoff. Do yourself a favor and look up the original broadcast order. The chronological order ends on a much less fulfilling note. The ending of the broadcast order basically changed my life and launched me off into watching anime as a hobby. You won't want to miss out on it. This show is revolutionary in anime series history for at least two reasons. Least important, it helped usher in the era of dominance by Kyoto Animation, a phenomenal studio with a frustrating legacy. Haruhi was one of three spectacular series that each, in its own way, broke out or strongly influenced different anime trends. The other two, Lucky Star and Nichijou, preceded a long stretch when KyoAni's output, although often magnificent, has been plagued by glassy-eyed, knock-kneed high school girls not half as clearly portrayed and dynamic as the cute female characters in those three series. Second and most important, Haruhi created a space for highly intelligent and well-articulated science fiction with slice-of-life drama filled with piercing psychological insight, in the setting of innovative narrative labyrinths that can delight or drive people stark staring mad ("Endless Eight"). (The fact that Endless Eight drives people mad actually lays the groundwork for the towering anime masterpiece The Disappearance of Haruhi Suzumiya, the movie sequel.) It takes character stereotypes and weds them with pointed role relevance. There is an excellent reason for the club members' quirkiness. And as far as I'm concerned, it creates a unique relationship between Haruhi and Kyon of a sort that had simply not been seen before. This is a relationship of love and anger, fondness and fear, dependence and reactive autonomy. The show will delight, bewilder, and infuriate you. It will move, alienate, and traumatize you. It will make you laugh when you know something sad is happening and make you sad when everything seems to be alright. It imagines a world where the universe is run by a lovable and well-meaning narcissist and where taking a chance on love is the direst of high-stakes games. And the animation, art, character design, music, editing, writing, voice acting... Stellar. Beware of Endless Eight. That arc is probably the only real flaw in the series other then that if you haven't watched this series... What are you doing reading this for... Go watch it!... You're still here?...You want more of my opinion?...Well fine, but you better promise to watch the series after you read this. The characters are all memorable, possibly the most memorable group of a typical high school anime characters if you count time travelers, aliens, ESPers, the creator of this known universe, and Kyon... Actually Kyon is an ordinary high school student. The animation is done by Kyoto Animation, the people behind shows like Miss Kobayashi's Dragon Maid and the recent film A Silent Voice , do I need to say anymore. It has some memorable music as well as OPs and EDs. This is also the show to thank for Lucky Star's OP. I could go on and on about how I love this show but the point is GO WATCH IT ALREADY!!! P.S. After watching this series please oh please watch it's sequel film The Disapearence of Haruhi Suzumiya as that is a FANTASTIC FILM being in my top 5 favorite Anime films. What if God was a Bored and Unpredictable Teenage Girl Who Didn't Know She was God? 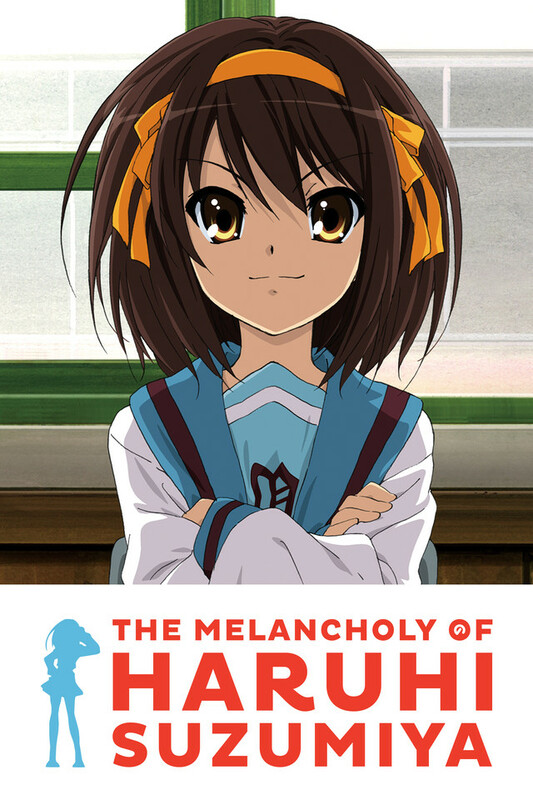 "The Melancholy of Haruhi Suzumiya" is a sci-fi, slice of life series revolving around the titular character, a 16 year old high school student who is unknowingly bending and reshaping the universe to her whim, and the SOS Brigade, the school club she starts in an attempt to keep herself consistently entertained. Told through the perspective of Kyon, the bored and sarcastic narrator and viewpoint character, Kyon will often have to keep Haruhi in line and help her mature into a more considerate and compassionate person (since the other members of the SOS Brigade are aware of her abilities and do their best to keep her happy causing her to be initially vexing to watch). Aside from the two main characters, the series is full of very likable supporting characters, the nature of the other three characters would be a spoiler for the first few episodes. The plots of the series will often swing back and forth between the mundane (such as a club baseball game or school festival) and the fantastical (such as time travel, mansion murder mysteries, and alien martial arts battles). The opening and end credits are iconic and the evolution of the characters' friendship with each other is deeply satisfying to watch. Overall, if you've seen this series already, you know how good it is. If you haven't, you should drop what you're doing (unless it's kind of important) and watch the first three right away. When you've finished the series, watch the follow-up movie, "The Disappearance of Haruhi Suzumiya" to get some closure on the show. If you still can't get enough of this universe, check out "The Disappearance of Nagato Yuki-chan" which takes place in an alternate, less interesting universe but is still charming nonetheless. Also, when you've reached an episode called "The Endless Eight Part I", watch that one and then skip to the last part of "The Endless Eight Part VIII". Die hard fans of the show may shun you but if you're past high school age, you absolutely have better ways of spending your time. Enjoy this 2000's classic! tl;dr: This show is good. Watch it. Then watch the movie. For your own good, only watch the first and last parts of the Endless Eight.